Seen, Chief. And acknowledged. Thanks for the explanation. Just a few small points: I certainly don't count the PM or the current Transport Minister as knowledgeable on the needs of the Navy. BTW, minister Garneau ceased to have any relations with the RCN before the Navy ever got it's first Halifax frigate. He is "steamer" era, an era when we had three AOR's and a single focus on ASW in the Atlantic, with few overseas deployment outside NATO. Also, the VCDS who made the original point before the Senate committee was not the one in court, but his relief - an Army general. Also, if any one here is interested in pushing the "oversea's yards are so much better" mantra, I suggest you follow the story of the Quebec ferry F. A. Gauthier. It is a brand new (launched in 2015) build from Fincantierri, in Italy, and has never worked properly from the start, with constant engine/gearing/control systems breakdowns. It has now been removed from service indefinitely in order to figure out what is wrong and try and fix it. The government of Quebec had to make an urgent acquisition of an old, smaller ferry from Nfld. And BTW, it had been certified for service by Lloyd's surveyors. You know you may be surprised but I do think personally we do have the need for a second AOR right now. Regardless of my opinion, I follow what the RCN and government sets as our requirement's. I know Marc Garneau's knowledge as a CSE on HMCS Algonquin in 74 and his retirement from the Navy in 89 is from another era and he's a politician but still knows more about the subject than most. As you have brought up overseas yards subject, Newfoundland has also bought offshore and has had problems with their ferries very similar to what you have mentioned. I think any yard could have the potential of having problems with designs and that goes for naval vessels as well as we often don't hear about those problems. I still like the offshore option that even though there probably will be issues to be addressed, its still cheaper and faster. As for the Lloyd's surveyors comment its interesting to note that the CCG is moving away from using them and are moving towards ABS to do their surveys. I may get into some trouble over this comment but whatever. Our military leaders are good tactical thinkers but since our military history has been one of subservience to our colonial masters (France, then the UK and now the USA) we have left the hard work of strategic thinking to them. Coupled with a civilian political culture of providing the barest minimum of funding to stop the Americans from setting up bases in Canada its no wonder we turn ourselves into pretzels debating about having an AOR constantly available on each coast. Coasts that are separated by a couple of weeks of sailing! A mature, strategically thinking nation would have long ago decided that at a minimum we would have 6 AOR's in order to have one at sea or ready to sail on each coast. I could go on and on but everyone here knows my feelings about our defence needs. Garneau and Leslie have both sold their souls to the political gods of Butts and Tedford (PMO office leaders who really run this government) so I really discount any public statements those two have towards defence. In defence of CRCN, I have a feeling that he was told in no uncertain terms to tow the Government line or the RCN will suffer the consequences. Finally, events with China, India, UN (Mali) have proved to me that this PMO is so over their head when it comes to international relations that I'm surprised that any country's leaders answer the phone when they see Canada on the call display. I saw the (still unfinished) Davie Product when it arrived in Halifax. I was concerned about the public 'it's done and ready to sail' vs the visible to me 'holy cow there seems like a lot of work to do still'. That said, the work got finished, the ship left the wall, and from what I've seen and heard, seems to have done OK. Looking at the other side of the coin, I have personal experience with ISI's standard of work having taken several ships through their 'tender' care, and based on things I have seen with my own eyes, I use the words 'wilful and deliberate' in describing some of their output. I will also note that we have to strip pretty much every piece of visible brass off the ships we send in, otherwise it 'disappears' - fire hoses with ends cut off, bulkheads with talley plates missing, etc. I have very little faith in ISI products. I have slightly more faith in the limited products I have seen from Davie. In my opinion, both are out looking for the dollars...it's all about the money. *shrug* they are both businesses, and that's what they do. Nature of the beast I guess. To consider, I was offered a job at ISI a couple of years back....they came looking for me...I responded with "I have too much pride in myself to have my name on the same business card as the word Irving." Your individual opinions may vary based upon your own experiences and knowledge, however, I have my own based upon my experience. I suspect we won't see eye to eye, and that's OK. I'm not looking to change your mind. I'm curious as to the reason of 'why not' buy another interim AOR. Trying to think bigger picture. There seems to be a shift of thoughts around potential future conflicts towards them being state v. state. I.E the building threat of Russia and China vs the talk of terrorism in the recent past, Correct? These 2 countries (among many others) are capable of sinking naval ships, Correct? So what happens when you build the absolute minimum (or just below it in this matter), and just 1 of our 3 AORs (assuming all 3 will be in service at the same time) is sunk? We lack the capability to build another as fast as we did in WW2, and a replacement would cost hundreds of millions and require a complete re-prioritization of any build schedule. Or is there a thought somewhere that this is not possible? Not only that, but in any future state vs state conflict, just being able to provide an AOR to allied ships would be a good start in showing support for our allies. Similar to the air force providing tanker support in a conflict where we don't have any fighters - a useful contribution that enables the assets in theatre to function. That, and the fact that the RCN effectively has 2 fleets - one on each coast - means one of those fleets doesn't have an AOR as it currently stands. An interim AOR would ensure both fleets have tanker support, and the RCN has one available if one needs repairs/refits. With the exception of seeing a contract signed for FWSAR, and I don't see the current government really doing much of anything substantial in the defense portfolio. The only reason we have a SINGLE AOR now is because a true former leader in the RCN pushed ahead & made sure the contract signed by the previous government didn't get cancelled, and he's been thrown to the wolves for it. Exactly, offering AOR's seems to be a perfect fit for the Liberal world concept, high value, low political risk, along with the ability to support peacekeeping, humanitarian and disaster relief. It's a PR bonanza and using merchant sailors actually strengthens our whole maritime system and adds to the career stream for ships pilots and Deck/Engineering officers. LPC sight of eye ends at the Lachine Rapids to the east and the Niagara escarpment to the west. Two spots where water abounds ... yet they don't get that Canada is a maritime nation. I shouldn't single out the Liberals. The Tories, NDP, Greens, PPC and pretty much all of our media don't get it either. I wasn't singling them out as an exoneration of all the others. Trust me on that. The Organization for Joint Armament Co-operation, OCCAR, has signed a €1.7 billion contract on behalf of the DGA French procurement agency with Chantiers de l'Atlantique and Naval Group for four Italian-designed logistic support ships. Italian shipbuilder Fincantieri will supply part of the hulls and technical assistance, having designed and built the recently-launched Vulcano for the Italian navy as the design base for the vessels [emphasis added--no such help for Seaspan]. The ships will be built in Saint-Nazaire on France’s Atlantic coast, and the first two will be delivered by 2025 [emphasis added] to start replacing the last three Durance-class command and supply ships in line to be phased out of the French navy. 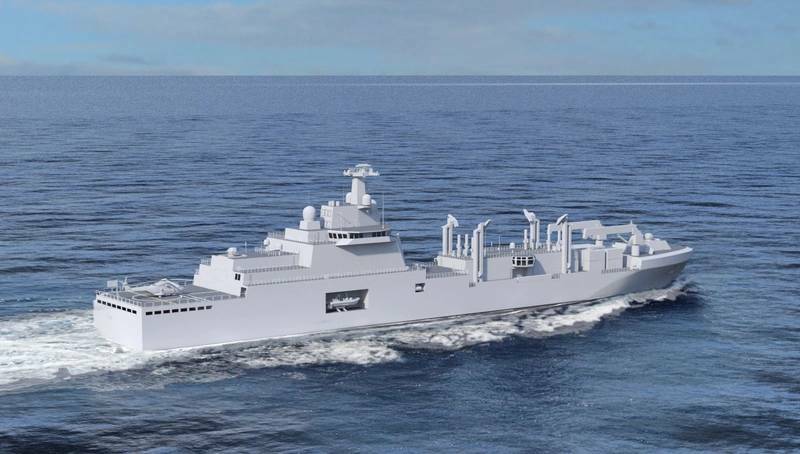 “Through this order, our expertise in the design and construction of complex ships, civilian or military, is acknowledged once again,” Yves Pelpel, senior vice president of naval programs at Chantiers de l’Atlantique, said. "After the construction of the Mistral, Tonnerre and Dixmude LHD platforms, we are proud to contribute again, in partnership with Naval Group, to the modernization of the French navy’s fleet.”.. Artist rendering of the future Protecteur-class ship replenishing a Canadian vessel at sea. Interesting that they feel they require 4 to maintain continuity. Kinda puts the lie to the thought that we don't need a second ship now doesn't it? And France is also a two- coasts country ( Atlantic & Med. ), so they need 4 units. Interesting that Italy seems to have overtaken France in naval construction. labour costs and social obligations have priced France out of a lot industries. True. But with the caveat that it takes only three days for France to swing one AOR from the Atlantic fleet home port to the Mediterranean one and vice-versa, as opposed to three weeks for us in Canada. So... Canada needs 4x7 AORs? It's not just the days. The main point is the criteria behind: two fleets, one per coast. What if the Panama channel or the strait of Gibraltar were "blocked" in case of conflict? On the other hand, France has overseas territories in the Caribe and the Pacific. This just came out - JSS timelines 'moved up' - though they DO NOT put a date/year on when this will occur - still not expecting one ready and delivered to the Navy before 2022/23 at the earliest. TTAWA — In a move likely to send shockwaves through Quebec and its shipbuilding industry, the federal government has decided to speed construction of one of its permanent new naval support vessels. The government's multibillion-dollar shipbuilding plan has long called for Seaspan Marine in Vancouver to build an ocean-science vessel for the Canadian Coast Guard before turning to the navy's two new support ships. The decision to now finish the first ship will "build on the good momentum underway," said Public Services and Procurement Canada spokesman Pierre-Alain Bujold. It will also ensure the shipyard stays busy so workers aren't sitting idle or laid off while they wait for the ocean-science vessel, he added, and allow time for lessons to be absorbed before construction of the second joint support ship. "This decision makes good sense and is a prime example of how the (national shipbuilding strategy) allows us to be flexible in meeting Royal Canadian Navy and Canadian Coast Guard requirements while finding efficiencies at shipyards." And gov't now does not even have a timeline for Seaspan to build the Diefenbaker, the (one only) new polar icebreaker ( http://www.dfo-mpo.gc.ca/rpp/2018-19/SupplementaryTables/mcp-eng.html ) for CCG, to replace 50 year-old Louis St. Laurent ( https://inter-j01.dfo-mpo.gc.ca/fdat/vessels/vessel-details/81 ). That ship is supposed to be final build in a firm series, maybe now sometime in 2030s? pardon my ignorance, but isn't it better to build all of one type before moving on to another? That way you order multiple sets of the same item, reducing costs for suppliers who can set up to assemble in an assembly-line format rather than building one off's and then moving on to another? Better to build both JSS or finish building the science ships with common hull and propulsion designs rather than jumping back and forth. This brilliant move will only end up costing even more and for little if any gain. Getting Davies into the equation would allow us to bridge over for the navy while providing a good back-up in the form of the second Asterix but more importantly get the coast guard the ship they absolutely need before the St. Laurent sinks at her anchor. Sounds like all the posturing by Davie has backfired on them, no chance of selling that second IAOR now. I would also imagine as soon as the first JSS is delivered the government if Liberal will cut Asterix loose. Happy for Seaspan, I wish Davie would dial it back, I am happy about what they did and support a 2nd ship from them, because I want 4 AOR`s. I've witnessed first hand the latte sipping hippies that seem to land 'advisor' jobs at Global Affairs, and comments have been made about those individuals here also. (I'm not speaking about the seasoned folks who have been there between political parties, but rather the lackies that follow around and 'advise' the ministers.) I seriously wonder why some of our senior political appointments don't think about both sides of the coin, and try to come up with solutions to make their base happy, but also grow their base by converting folks who may otherwise vote for the other side of the coin. In regards to this matter, the Liberals would have been far better off going along the lines of "The previous government didn't include Davies in the shipbuilding strategy due to the restructuring happening at the time. However, as we re-evaluate the strategy and make decisions on how to proceed, Quebec should absolutely be included as we value the skill, hard work, and dedication these families bring to the country. The recently acquired icebreakers were sorely needed, and Davie did an amazing job at getting the ships available on time and on budget. It's a shame the previous government didn't see the value you bring to the country, but we do." -- or whatever other pandering nonsense they want to come up with. - Davies is included. The GoC gets another major shipyard producing ships it needs. It possibly wins some votes in a predominantly Conservative region - which, you know, might be important given an election coming up. Stabilizes employment in the region. - It allows for the RCN to have 2 AORs. 1 per coast. Allows the RCN to still deploy one, if the other has an accident, needs repairs, needs work, etc etc. It also allows for a spare, which the GoC can lease to other countries when needed - ironic, since thats what we had to do not too long ago. - It allows the GoC to deploy a ship of this sort to emergency situations & disaster relief, which is always great for PR. While most countries, organizations, and groups of sensibly minded people have a meeting to discuss "What can do we do maximize our options while staying within a certain budget?" I swear our meetings must be like "What can we do to limit our options as much as possible, so we don't actually have to do anything?"